The Aerospace Standard AS9100 includes ISO 9001 quality management system requirements and specifies additional requirements for a quality management system for the aerospace industry. AS9100 is recognised by all major Aerospace OEMs. The aircraft and aerospace industries have recognised AS9100 as a means for continually improving quality and on-time delivery within their supply chain. Most of the major aircraft engine manufacturers, such as General Electric”s Aircraft Engine division (GEAE), Boeing, Rolls-Royce Allison and Pratt & Whitney, are requiring their suppliers to be certified to AS9100. 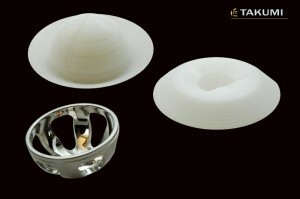 Gerry Reynolds, company co-founder and Managing Director, Takumi Precision Engineering, commented, “In order to develop our capabilities and to offer a higher level of service to the medical device sector, Takumi has implemented the medical device quality manufacturing standard, ISO13485”. He continued: “This is a very exacting quality standard in terms of traceability, workmanship and staff training. Considerable preparatory work was required in terms of ensuring that Takumi’s internal procedures complied with this standard. According to Mr Reynolds: “Takumi management are confident that the acquisition of these standards will enable Takumi to seek out work internationally. The aerospace and medical sectors have been identified by management as growth areas that are not as exposed to the global downturn as other manufacturing areas.